If you live in Forest Gate E7 and have DIY or builders waste you need to get rid of fast look no further than Away With It. 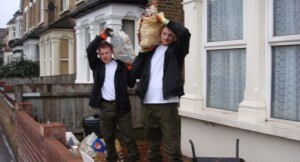 We provide builders waste removal Forest Gate homeowners and businesses trust for flexibility, quality and cost effectiveness. In the majority of cases we can offer a same day service. As fully licensed waste carriers, we’ll make sure that all your Forest Gate E7 DIY and builders waste is properly and legally disposed of. We also work hard to ensure that as much of our customers’ waste as possible is reused or recycled , generally around 80%. And it’s not just the environment we try to make a better place. If we ever have to cart waste through your home, we’ll always put down our own dust sheets. And we’ll give the place a sweep and tidy up afterwards too. Just call us up, and we’ll give you a two hour slot at a time that suits you. An hour before we’re scheduled to come, we’ll call to confirm our ETA. We’ll provide a free no obligation quote that takes into account all labour, transportation and disposal fees. So you know that the price we quote is the price you will pay. 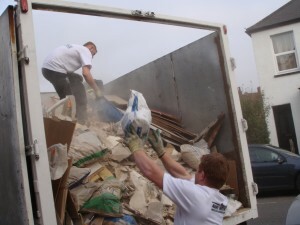 If you think our quote is reasonable (and because we’ll only ever charge you for the space your waste takes up in our truck, we’re sure you will), we’ll simply come along, remove all your DIY and builders waste, and leave your premises spick and span. To discuss your needs for builders waste removal Forest Gate call us today on 0208 504 7390 or 07957 123019 and we’ll be happy to answer any questions you may have. Or for a quick and easy quote in no time at all without picking up the phone, fill in our handy online form with all the relevant details and we’ll get back to you quickly.